There have been many news articles lately about Organizations donating items of need to an particular country or institution and the items not reaching the people for which they are intended. Instead it is stored in a warehouse and then sold to those lucky enough to afford the item. 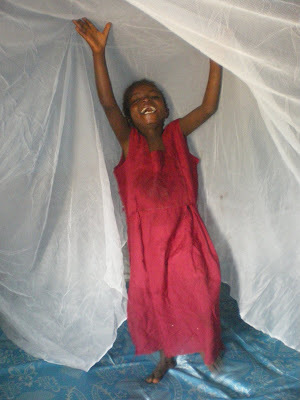 Such is the case with the mosquito nets we purchased. We bought them in bulk in Freetown, counted them quickly and immediately shipped them to Kabala for the students and their families. We did not have the time to read the bags in which each netting was enclosed. Once we began to distribute the nets in Kabala, we became aware that we had paid for something that should have been distributed to the people for FREE. We found ourselves with the nets in hand and the need surrounding us...so...naturally we distributed them as planned. It is disturbing to donate an item thinking you are helping a group of people, only to find out that someone is hording that donation to resale and make profit, while more and more children are dying of malaria. There are nets given for them, they simply aren't receiving them. However, need breeds greed. It is not acceptable, but I do understand. People in such great poverty resort to anything to put bread on the table for their families. THEY ARE HUNGRY, VERY HUNGRY. This is not a situation specific to Sierra Leone, it is a common occurrence in many poor countries. In Sierra Leone, the government is working very hard to overcome this problem. It takes time. It won't clean up overnight. This is where Nazareth House approaches this situation in a different manner. We have been blessed with a tremendous staff in Sierra Leone, both in Freetown and in Kabala. We personally deliver and hand out the needs. Nazareth House builds relationships with the people it serves. Its not a "here's a handout, see ya later" kind of deal. Once we assist someone or organization, we continue with them, checking out to see that they are okay and that they have what they need. Our goals are to help them in such a way to rise above adversity, if not monetarily at least emotionally. We can't promise everyone that we will change their lives or make them prosper. We can't and we don't. That is not what Nazareth House is about. We do promise to keep an eye out for that person/organization/family. We don't invade privacy and swarm over them intrusively, but check in...they have become part of the Nazareth House family and we look after one another. Recently James returned to Kabala. Pa Foday has been monitoring the bed nets that we gave out in the Fall 2008. He checks to see that the families are using them properly. 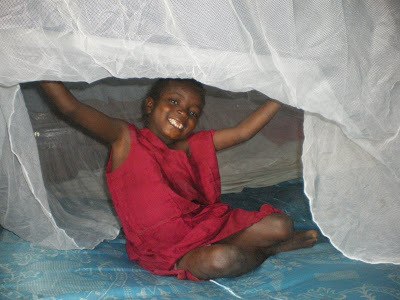 Pa Foday and James and I are happy to report, the bed nets are being used properly, remain with the families for which they are intended ...and as you can see from the joy on this little girls face... Mosquito Free makes for a happy state of mind.